Over time, I noticed that my eye and neck skin were not improving or even maintaining good health when compared to the skin exposed to DIY advanced skin care methods. When I noticed this difference, I made a choice to treat my eye and neck skin the same as my facial skin and began applying strong DIY active ingredients and dermarolling treatments to the eye and neck skin. As a result, my eye and neck skin are slowly rejuvenating. 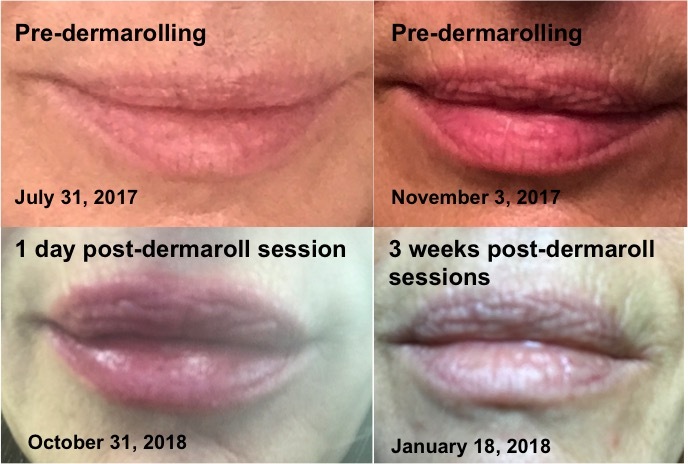 In late 2017, I developed upper lip lines and began using single needle dermarolling treatments on the lines. In October 2018, I realized that I would also need to rejuvenate my lip skin to reduce the appearance of the upper lip lines. Internet searches at the time showed mixed opinions for dermarolling the lips. Simplistically, skin consists of an outer epidermis layer with a dermis layer beneath. The outer layer of the epidermis is the stratum corneum, which consists of dead skin cells that continually shed. The epidermis consists of specialized cell types, including melanocytes, which produce the brown pigment melanin. The health of the epidermis is dependent on nourishment received from the dermis. The dermis consists of blood vessels, collagen and elastin. Lip skin differs from regular skin due to a thinner stratum corneum and epidermis, which exposes the color of the dermis. In addition, lip skin is devoid of melanocytes, which further exposes the bright color of the dermis giving the lips a soft pinkish-red color. I decided to dermaroll my lips using the Derminator® 2 digi-needler by OwnDoc. Dermarolling, percutaneous collagen induction (PCI), and microneedling all refer to a facial treatment developed in 1997 by Dr. Desmond Fernandes. Dermarolling originally consisted of a roller with small needles that are rolled across the skin. Different needle lengths are used for different purposes. Deeper needle lengths that reach the dermis cause micro injuries, which initiate a cascade of biological healing processes that result in a connective tissue network comprised of collagen and elastin. I have dermarolled facial skin for ten years, completing 4 to 6 deep treatments per year. I recently began using the Derminator® 2 and because of it’s ease of use, have been able to complete more comprehensive treatments. For example, using the Derminator® 2, I am able to use a single needle cartridge to treat upper lip lines that had recently appeared. When I noticed that lip lines extended into the lips and that the upper lip had lost its original volume resulting in a deflated appearance, that is when I decided to dermaroll my lips. Using the Derminator® 2, I began dermarolling my lips using a 12-needle cartridge at a 0.25 mm needle depth at high speed. The Derminator® 2 design eliminates most of the discomfort of dermarolling based on its speed and needle design. I began shallow dermarolling treatments on my lips every 3 to 4 days over several weeks. Immediate results included minor swelling of the lips, increased circulation and enhanced lip color. I completed two deep dermarolls using a 1.0 mm and a 1.25 mm needle length after applying and then removing numbing cream. Initially, my lips peeled quite a bit. I used a gentle micro-dermabrasion cloth to exfoliate daily. Over time, the peeling subsided. I have completed shallow and deep lip dermarolls and gone to work the following day. For me, the slight lip swelling lasts one or two days. It will take 3-months to a year or more to experience the full results of lip dermarolling. So far I love the results and if possible I will continue to dermaroll my lips until they return to their full former health and to maintain lip health over time. Dermarolling the lips will not change the original shape of the lips. However, dermarolling will promote collagen and elastin production and over time may rejuvenate lip health to its former glory or at a minimum improve lip skin health. For effective and timely healing results it is important to start with a foundation of good health. Author photo, taken in 1988 at age of 29. Author photos taken over time (age from 58 to 59 years) under different light conditions, bare or with lip balm and with slightly different expressions. 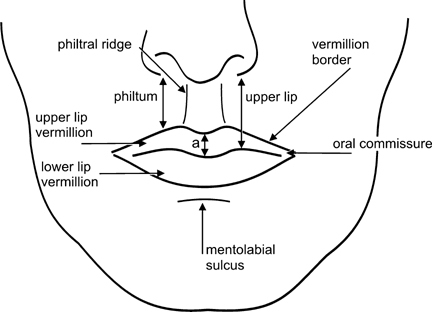 “Dermarolling can perhaps improve lip creases and “refresh” the lips but it cannot really increase their size”; “Dermarolling the lips can sometimes trigger cold sores in people that are very prone to them”; “The skin on the lips is thin so take it into consideration when you choose a needle length”; “Do not forget to disinfect the lips. The mouth is full of bacteria.” Check out the OwnDoc forum for more information here. I wish that I had begun rejuvenating my lips sooner but I know that with time, I can greatly improve the health of my lip skin using DIY advanced skin treatments. If you need more information, conduct a little Internet research, read my past Blog articles, or get my book "Skin Remodeling DIY: An Introduction to the Underground World of Do-It-Yourself Skincare". This article is intended to be used as general information only and is in no way intended to replace medical advice, be used as a medical treatment program, diagnosis, or cure of any disease or medical condition. There are no warranties, expressed or implied, regarding the effectiveness of the practices described in this article. Products or substances discussed herein are for educational purposes only and are not intended as recommendations of the author.